61 Responses to Enter the Snowpass Contest! My son William would love to try skiing for the first time! Mary Anderson – thank you so much for the contest. My son, Simon, would love this! Great contest! My daughter Klara age almost 10 would love to try downhill skiing! I want to try skiing or snowboarding! Tara Hanley, my son Grey, Grade 4, would love this! 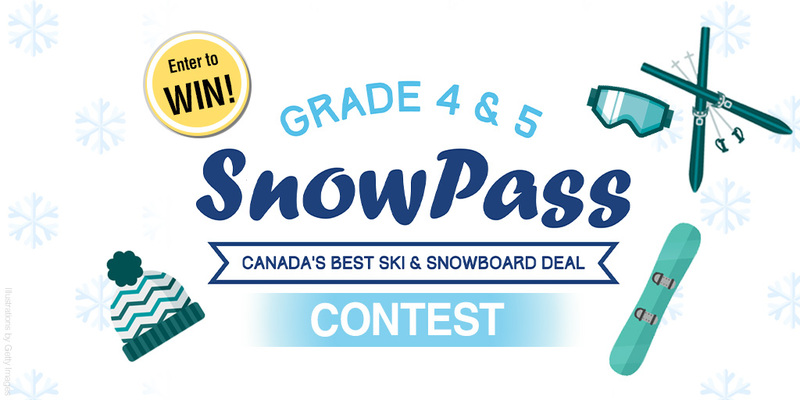 My son, Lukah, would be so excited to win a Snow pass! My sons name is Aiden and he loves to snow board. He would absolutely love this! Mike Osmond – Good luck everyone!! I would love to try skiing! My son is Xavier is 10 years old and he is a huge fan of winter fun and sports! He would absolutely love to win a snowpass! My son Kiernan would LOVE this!! My son, Ethan in grade 4 would love to hit the slopes. How amazing would this be for my 10 year old son! My son Isaac would love this! My 9 year old would be all over this! Thanks for the opportunity! My name is Cassandra, and my son Sawyer has been asking to learn how to ski. My Grandson would love this. He is just learning to ski and is crazy about it. Great way to get outside and enjoy this wonderful sport. My son, Timothé, would love this! Jennifer Wilson, my 9 year old granddaughter would love to win.